Surely not a page dedicated to KFC I hear you cry!?? Yes, but this is different. It is a KFC review around the world to find the best, worst and what this may tell us about food culture. Yes. We love food, we especially love local food that is honestly cooked, based on the ingredients of the area and lovingly prepared. Food is a perfect reflection of anyone’s culture, upbringing and local geography. As such food is the cornerstone of what people are all about. 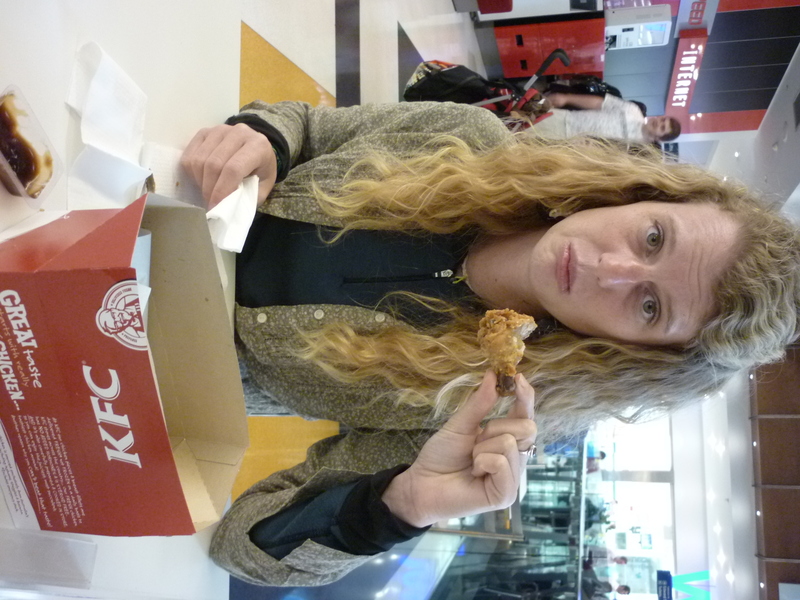 It is perhaps surprising that amongst this we decided to try as many KFC restaurants around the world. Only once per country was necessary. Yet it is an important one as it gave us a contrasting view of what food people traditionally prepared compared to how one that has been imported. The added ingredients of what should be straight forward breaded chicken is high, yet not uncommon. You can find how they make KFC products here. What is interesting is the amount of artificial and industrially produced additives that are in the KFC product. This is of course not abnormal from most of the foods the western world eats today in order to taste better, last longer and take on an image of what you think you should be eating. Fried food tastes good. Fat is biologically addictive as a flavour and flavour enhancers make fatty foods taste better still. Yet they are undeniably unhealthy. That said there are many fatty foods in the world, some traditional food is based entirely on hunks of pure fat. So why should these chains be targeted as pushers of fatty food? They are fried foods and so are naturally high in saturated and trans fats that are the least healthy, causing heart and cardiovascular problems. Everybody knows that, or at least should. 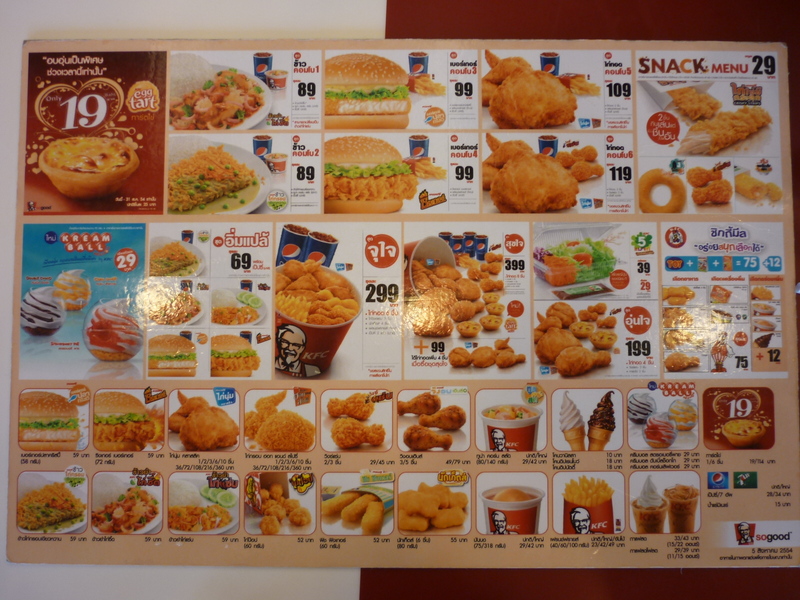 The nutritional information of KFC can be found here. 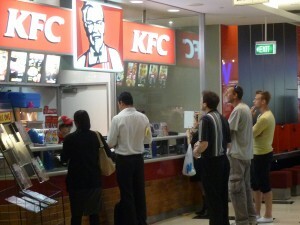 Fast food chains perform a function of serving quick and relatively cheap food. This has the obvious knock on effect of being of questionable quality that the industry has had to fight for years, either in terms of the standard of the base ingredients or the treatment of the livestock etc. 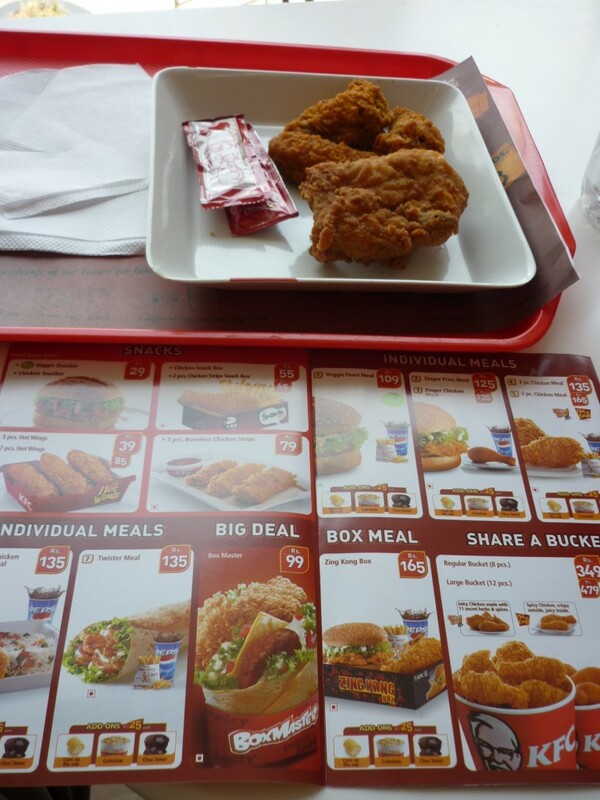 We to stick to sampling 1 piece of chicken and a few chicken wings to keep things consistent as a measure, where ever we found a KFC outlet. What does KFC say about local food? The interesting thing about KFC is how much it is localised to suit the local tastes and is modified to include some of the local food. This is down to the franchise model that KFC use and the freedom it gives to their franchisees to give each country its own ‘flavour’ of KFC. 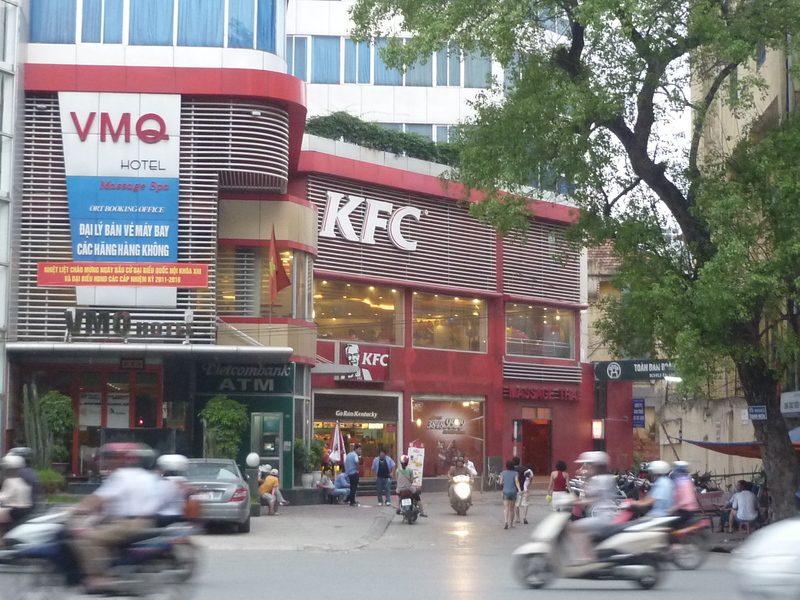 You can see this in the KFC website, which does not link to any other of the KFC websites in the world, for example the Vietnamese KFC , which is completely different in layout and content delivery itself. It is as if each company is based on their love for fried chicken, they are given the basic recipes and then left to do the rest. Whether this is good or bad can be debated, but it is interesting at the very least. Which local food are incorporated into the local KFC will give an indicator of the popular dishes/ foods that are eaten in different countries. We will also look at the portion size and cost to find a trend on how much chicken was served as a “family size” and what kind of family and class of people this might appeal to. We will review the type of restaurant who was eating there and where it is located. 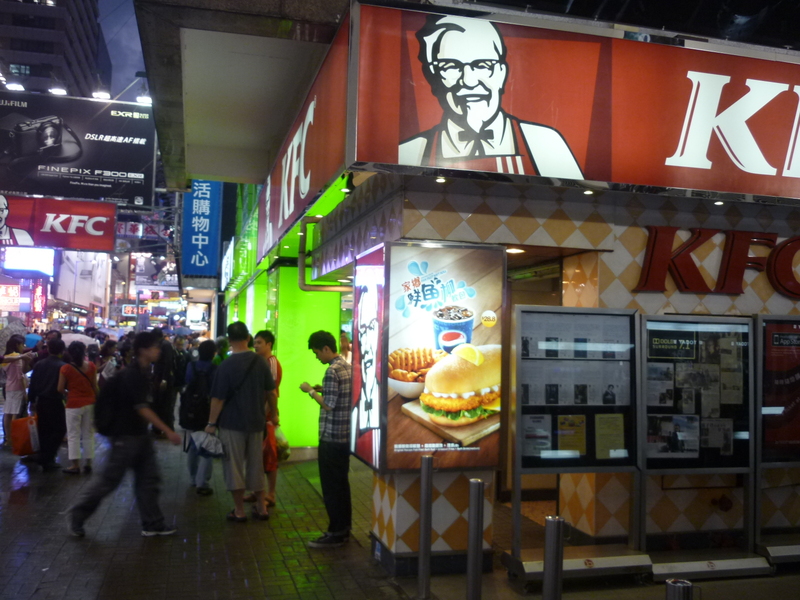 Unlike McDonalds and Burger King, which are much more standardised, KFC has a greater variance between countries. The entire experience overall will give us a totally different perspective on the food culture of that country, how they treat fast food, reject or incorporate the western varieties and who it appeals to. It has certainly brought some unexpected surprises. Travelling as part of a pair has its advantages and this is one. Two opinions and luckily from the opposite end of the spectrum. 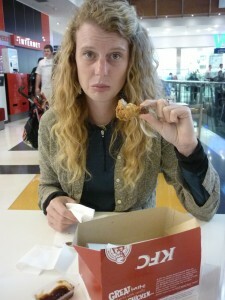 The convert buys KFC occasionally in the UK and prefers friend chicken fast food to all others. The skeptic on the otherhand “cannot stand the batter and greasy coating”. We both agreed to try the KFC together however and discuss our thoughts mostly in the hope that the convert can prove that KFC is ok to eat, while the Skeptic is out to show that there is no place for it in the world. 75 rupees to the pound in May 2010, which means that an 8 piece bargain bucket is only £4.20. Exceptional value and the cheapest we found in all KFC around the world. £2 for a 2 piece chicken meal is also amazing. 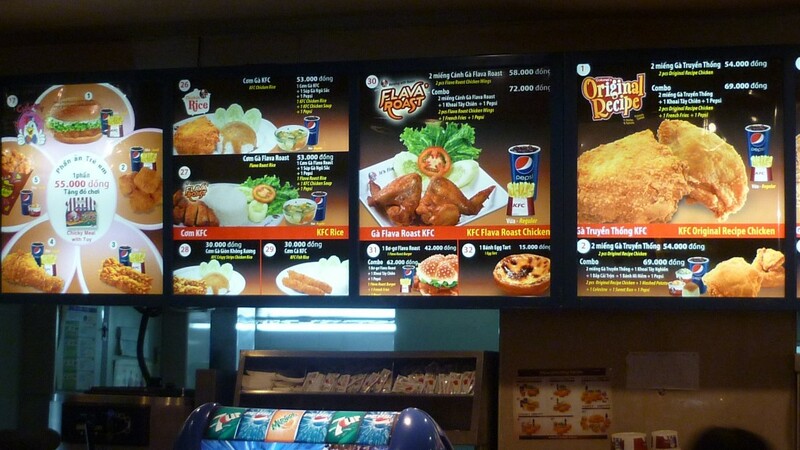 Very standard and similar to the western menu. There is a “Choc Amor”, which is interesting as we wonder whether they would understand the French reference- and doubt it. There is a vegetable rice dish that is served as a main meal, but this is pretty much the extent of a vegetarian option. Surprising given that many Indians are vegetarian. 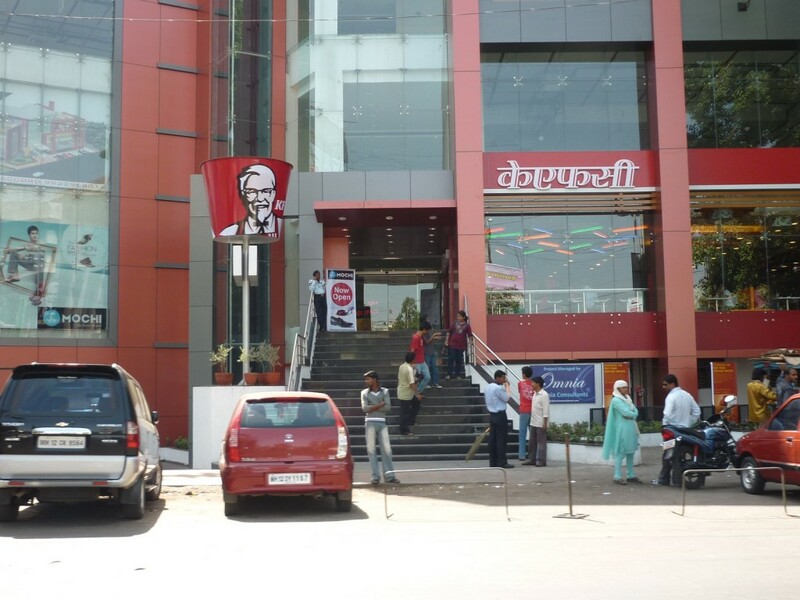 We suspect this is due to the fact that KFC in India is a destination for the middle to upper classes only. Not great, but not bad. The coating is just a bit bland. The chicken is fairly tough and I learnt that the Indians use local chicken (as they should). Yet this means that local chicken is often leaner and more muscular, which makes tougher chicken. The spicy wings are really nice and hot! Errrr yea, ok. It tastes like a KFC what can I say? 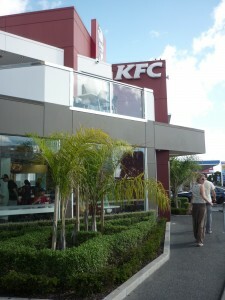 This is also the only KFC and located in the rich area of town. Generally well dressed university students from the local medical university. This means by default that people come in groups and socialise. It is busy, perhaps more so as it is lunch time. A pretty average experience, but out of this world prices. Pretty average for a western fast food restaurant. About £14 for a 4 person family feast and £4 for an average meal. Solid fries, crispy and well cooked. Chicken pieces are crispy but the stack of chicken that is sat under hot lamps has led to the chicken being slightly dry. Mountain Dew for me is a bonus. Good fries actually. They are not greasy or soggy which makes a change. Popcorn chicken tastes of nothing though and is pretty dry. Lots of over weight people, young families everywhere eating piles of chicken. I have not seen a restaurant eat so much per group. Upstairs there is a play area and further suggests that this is a place that is designated as a family restaurant. Gave us free sauce (BBQ), but we were limited to one each. Tomato ketchup was free. We travelled in Australia during a strong period for the Australian dollar (AU$1.2 per £1), which makes a frozen drink for around £3.25 is extortion. 2 chicken wings costs around £1.50, which is the same price as 2 pieces of chicken in other parts of the world. 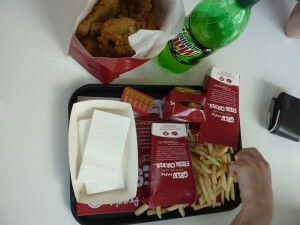 Family Feast consists of just 10 pieces chicken, large fries, potato and gravy, coleslaw, 1.25 litres soft drink. Specials include ‘Healthy’ chicken salads, Krushers frozen drink and Kookies’n Kream ice cream (AU$3.95). Worst chicken we have ever tried, soggy and greasy on the outside and dry in the middle. Bland. Horrible, really horrible. Positioned in a shopping center where chairs are communal with other restaurants. Really busy and hectic environment. All kinds of people, eating with their hands rushing during their lunch hour. Rubbish everywhere. Pretty grim and the fast food nightmare that people often associate with it. Charge 20p for tomato ketchup, which really irritates me. Chicken and chips with ice creams and bottles of drink for a feast. Recently however snack boxes are becoming popular to compete with the cheaper fried chicken outlets and value items like a chicken wrap for just £1.50. This attempts to tap into the “on the move” snack market, which is eaten on the go and served all in one box. Really, really greasy. Cannot be said to be dry, but the batter can be peeled off in one go. It is a thin layer of coating, that is saturated in fat. The hot wings need more spice and are not very spicey at all! The fries are hit and miss, sometimes limp and sometimes nice and crispy. The chicken itself is tasty and a good size. Fast food – greasy and bad for you. I really cannot eat much, as it’s really filling and makes me feel unhealthy immediately. Many kids hang out after school, many students eating. Most people buy KFC to take away and eat at home. Turn over is high and the atmosphere fast paced. No one would come to KFC here for a quiet sit down meal. Just quite a mess and hectic. Not really a place to enjoy food. 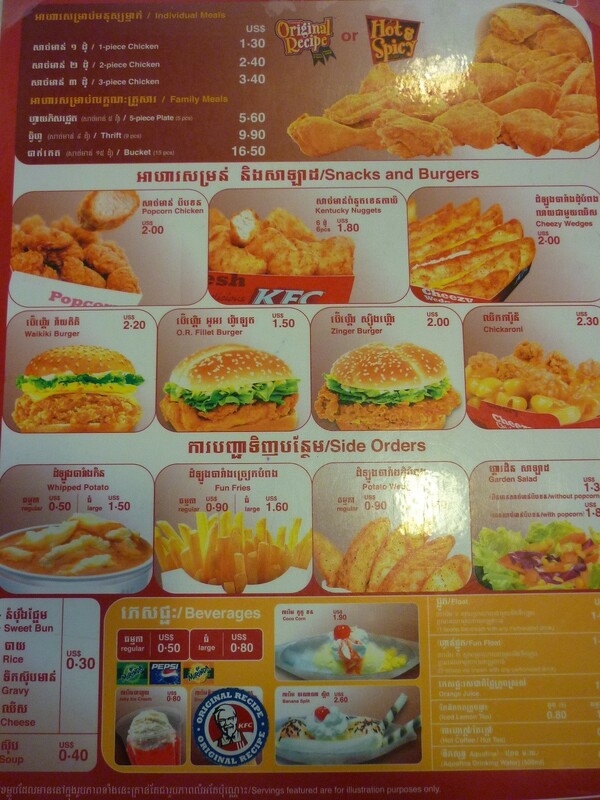 35 dong per pound makes this KFC a little more expensive than Thailand. An egg tart here is 42p each. £1.50 for 2 pieces of chicken is good and this can be upgraded to a meal (mash potato, coleslaw, sweet bun and a pepsi) for just 40p. The flava roast chicken is a popular variety across the whole of Asia and is relatively new, which means that it may be phased out if it is not popular enough. One of the key points we notice about the menu is how most meals are served with a small side salad and a Vietnamese style soup. Mash potato is also advertised heavily, while fries takes a lesser role in the meals, which are actually fairly well balanced. Rice and gravy is available as a fries replacement and meals seem to rely heavily on the side dishes and constructed with the sides as a start and then chicken added. 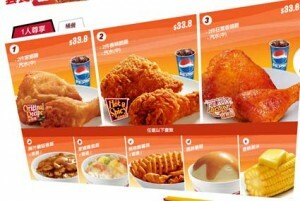 In the west (myself included) people choose a KFC on the basis of what type/ amount of chicken is desired and then sides are added. Interestingly the family feast and large meals are absent and may reflect the fact that they are not appealing to families. Really good and how it should be. The serving staff know what they are doing and that reflects in the quality of the food. It is a fine line between moist chicken and sloppy skin. This batter is fluffy, which gives it a good crisp and has a nice flavour. The chicken is steaming hot! The chicken is good and the spicy wings have a coloured skin underneath the coating, which looks like the chili sauce marinade. I haven’t seen that before. I haven’t seen a soup being served with a meal by default either and that actually works really well. All in all I am satisfied and wouldn’t mind coming back. Middle-class families, dressed smart-casually, eating with knife and forks. Couples eating together in the same manner, seemingly like they are going out on a date and this is the place to impress. A well dressed doorman keeps a vigilant eye out, opens the door for you and tidies away the trays left on tables. People loiter outside and hangout in the bright lights beaming out through the typical glass front. The cleaners are not just cleaners, but look after people, get them the things they need if they are sat down and ensure the floor is running smoothly and everything is tidy. Everyone is there to help the customer rather than to perform a specific task. More expensive than the UK. We were in Hong Kong May 2011 when the exchange rate was HK$12.5: £1. This makes a 2 pieces of chicken and a drink around £2.80. A family feast is sizable and will set you back £13 for 4 people. Cheesy chips and Mountain Dew? Jalapeno chilli peppers that give your meal a real kick? Yes please! The hot and spicy chicken is exactly that and has a good kick, but the chicken is pretty much standard fair to be honest. I am a big fan of cheesy chips though. The service was impeccably fast. I like the range of dishes on offer and gravitate towards something like the corn or mushroom rice. However the Flava roast chicken is pretty good actually and not dripping with fat. Glass fronted building, garishly lit inside and sterile feel. It all feels a little anime with the menu and clearly attracts the late teen- early twenty age group. The fact that the restaurant is open 24hours a day is also telling that it supports the night life crowd. The menu is insane and it seems that they have tried to branch out into all sorts of flavour combinations and dishes that extend way beyond chicken. Take the KFC pizza for example. The dollar is 1.50 to £1. Cambodia’s use of the dollar has an impact on how expensive food feels. However essentially the menu is pretty cheap. 86p for one piece of chicken versus £1.15 in the Uk and £1 for a large fries, which is the same price for a regular. Not actually that inspiring although the sundaes look incredible and the wedges are a good replacement to fries. The variety of burgers is interesting, but otherwise fairly devoid of local touches. The chips are fresh and crispier than usual KFC fries, which is something to be desired often. The chicken was fresh out of the fryer, however was not drained well enough and so has fat running out of the chicken on to my plate, which is a shame, but it does mean the chicken is cooked well and is perfectly moist. A waikiki burger with pineapple had to be done. It is a strange thing to have a Hawaii burger in Cambodia, but it is reasonable. The trouble is that as with most of these burgers the sauce, fake cheese and fat from the chicken is all slippery. Combine this with a thin bread bun that lacks substance and I just make a complete mess! The taste was ok though and lettuce not too soggy, which is always the case. The restaurant is pretty big and yet sterile and pretty empty, enough to almost make us lean in and whisper. This is the first ever KFC in the capital of Cambodia and for the entire country, open for just 6 months. It seems that this KFC was opened to take advantage of the city’s development and influx of expats, as well as the massive increase in tourists. The location is next to the passenger port that is the base of river tours for tourists and so the KFC is clearly intending on picking up this traffic. There is stiff competition though as the riverside as it is known is awash with tourist friendly eateries. The only people we can see who are eating are Chinese and white Caucasian. 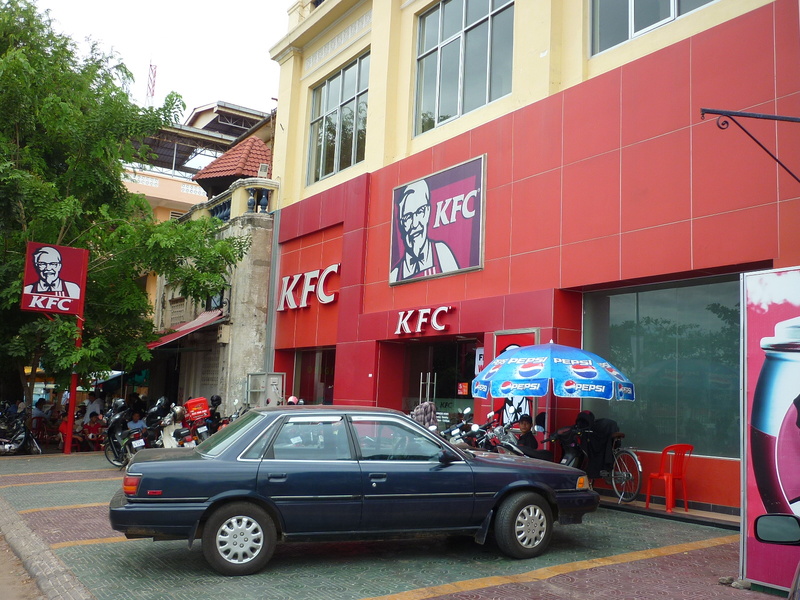 It will be interesting to see how well this restaurant does and to revisit this restaurant in the future to see how the clientele changes and how Cambodia adopts KFC. In August 2011 the exchange rate was 49 Thai Baht per £1. Reasonable value and about 8- 10% below what is paid in the West. 39p for an egg tart and £2.20 for a two piece of chicken meal is great value. Thai chicken green pea, chicken curry (89 baht) is made cheaper than a chicken burger (99 Baht), the best egg tarts we have had since Portugal, their own ice cream bar and cheap snacks. The outside of the coating is crispy and there is a good layer of batter as well. The seasoning is good, with just the right amount of salt, while the chicken falls off the bone. Nice. Love the egg tart! That really is very good. It is nice to drink a coke out of a glass and the chicken is not bad at all. Eating off porcelain plates, with a real glass and sauce containers really takes the eating experience up a level and makes everything feel more premium and dare I say it taste better. Certainly drinking out of a glass makes the experience feel more like a meal than take away. This shows. The place is packed with people wandering around looking for seats. People here are taking their time having a good chat and relaxing. The range of people here extends to a family table of mixed Thai and western people, couples and girls gossiping. As the restaurant is situated in the major mall of Chiang Rai full of western shops, next to the entrance it attracts a lot of traffic, which makes is atmospheric and bustling. The menu is broken down into individual snack sized portions that can be made up into a combination meal. Yet a lot of people are eating small portions and it seems that people here are using KFC as a place to grab a snack and socialise in a mall environment. Fast food culture is a world away from how people used to eat in the west historically and how most developing countries still produce fresh food in. Yet the influx of fast foods into developing countries continues apace in the search for convenience and is spreading globally at an incredible rate. The debate rages on the part fast food chains take in our society and our increasing use of them. Will they take over in the developing world like they have in the western world? Either way fast food chains are cultural markers and how they are adopted by different countries often says more about their current attitudes to food than anything else. This quest will continue whenever we visit a new country and is undoubtedly part of our foodie obsession. We hoped it would give us a different yet more complete perspective on how people consume food around the world and believe it has done. Experiencing fast food is like taking a snapshot of a countries development and westernisation. It in part reflects popular local food and bridges western and local taste. It seems that the Asian KFC outlets have greater respect for the KFC brand and the food it serves. It is more of a place to go and eat rather than a takeaway as it is mostly in the West. Thailand’s Chiang Rai outlet received the highest rating with 8.8 out of 10 as a result of good localisation, a varied menu, good price and excellent chicken. Where is the best fast food outlet you have visited on your travels? How does fast food relate to local food? Let us know what you think!